The development of the steamship in the early nineteenth century meant that the Red Sea became navigable at all seasons, and made possible the establishment of the so-called Overland Route between England and India, via Egypt. Marine surveys were carried out to determine the best routes and the most convenient coaling stations for steamers along the coasts of the Red Sea, and the Gulfs of Suez and Aqaba. Moresby was Commander of the East India Company's ship Palinurus, which took part in one of these surveys between 1829 and 1834. 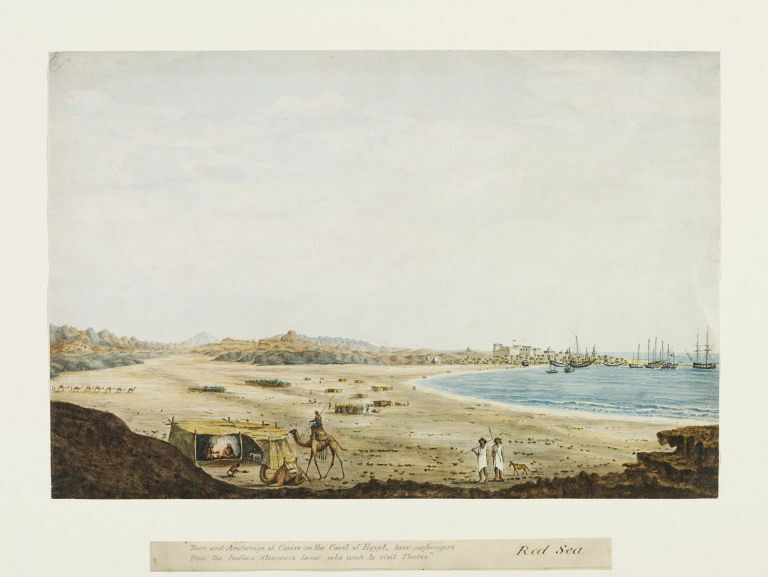 Their findings were published by the East India Company in Sailing Directions for the Red Sea (1841), where Qusayr is described as containing about 2,000 inhabitants. Here travellers, instead of sailing on up to Suez, could disembark and continue their journey overland across the desert to the Nile and thence to Cairo. 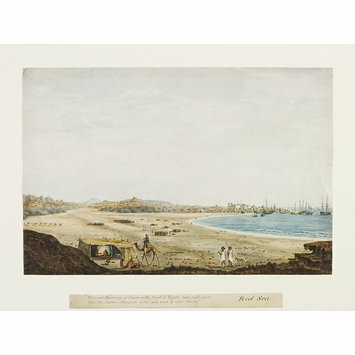 Seven other watercolours done by Moresby during this survey are in the Searight Collection (with five more at the National Maritime Museum, Greenwich). Though probably trained as a draughtsman at a naval academy, his compositions pay little regard to pictorial convention and are refreshingly idiosyncratic. Reproduced with variations in F.R. Chesney, A Narrative of the Euphrates Expedition, 1868, facing p.5; lithograph by T. Picken. SD.677-684 were done during Moresby's Red Sea survey, 1829-34. Five further drawings from this series are in the National Maritime Museum, see Searight Archive. See T. Elwon & R. Moresby, Sailing Directions for the Red Sea, 1841, pp.195-7.